Dave Stafford, September 2010: The making of “Perchance To Dream” took quite some time, because both Ken Mistove and myself wanted it to be something that was unique, something a bit “different” from the Dave Stafford and Bindlestiff catalogues, something that was a more advanced kind of ambience, something that really created it’s own world, it’s own mood – it would take you some place special, and you would stay there, entranced, until the entire record goes by. We wanted to make a record that once you put it on, you would want to just let it play forever and ever, it would just re-start, and you wouldn’t mind, you would let it play through continuously. Work started on the album not too terribly long after the release of the 1998 double-A sided non-album single, “Furniture Music” b/w “Portrait Of Emiko With Moon And Stars”, but while we started soon after that initial release, it took us a long, long time to finish each track. I am pretty certain that the tracks appear on the record in the order that they “appeared” – there was no re-sequencing. So we started with “unglass”, worked on that until we finished it, and then, moved onto “brittle” and so on, all the way to the last track, “cloud 8”. I would also though, say that there was some overlap, I am conscious that at some points in time, two or three of the tracks would exist simultaneously, in varying states of readiness, but I am pretty sure we tried to finish them in the same order they were created. It also took us a while to figure out our methodology, at that time, file sharing via the Internet was pretty much unheard of, so we were still at the stage of burning tracks to CDs, wav files, and sending them back and forth via snail mail. A very slow way to work, if you have to wait a week for an overdub to come back from New Jersey and you are in California, or Ken would have to wait for me to send him a CD from California – it took time. And, we were also both very, very busy – Ken was developing his own looping software, working with digital music in a myriad of ways, supporting the Elephant Tape web site, and supporting pureambient.com both technically but also as a performing artist. Meantime, I was working full time, trying to run the pureambient web site, and trying to record, mix, master and press a huge number of CDs by a variety of artists who were at that time part of the label. Not to mention the massive backlog of earlier catalogue items that had only existed on analogue media – all those needed to be transferred to digital and thence onto local CD manufacturing. I had a LOT on my plate – we both did. But we overcame these obstacles, and while it actually took somewhere between two and three years to get the record done – I think it was, and is, well worth the wait. This is a track that walks a tightrope between joy, peace and harmony and terrifying disharmony and the musical mayhem of dissonance. It is at once - both light and dark, happy and sad, joyful and terrifying – and that is by intent. A bright, happy, major scale motif starts us out, and it’s just such a happy sound, it’s made up, for my part, of energy bow guitar loops that have been treated with modulation effects rather than reverb effects, probably using my old favourite, the Bright Detune patch, which renders almost anything you process through it beautiful. Gorgeous, quasi-percussive synthesizers and hand bell-like sounds ring out, as the beautiful major chord “chorus of ebows” slowly and wonderfully modulates across the sound field – and is very quickly joined by happy, bright, major-scale reverse clean lead guitars, playing a very positive sounding, ascending scale – with a tiny hint of hazard at around the one minute mark, but then, all is well, the sun is still out, the tinkling percussion still sending out it’s ultra positive message…the reverse guitars move down into the bass register, more ringing percussion comes flying out – it’s the musical equivalent of heaven on earth. Until…until just after 1:40, when the positive drone is suddenly overlaid with an ominous, two-note trill, reminiscent (and indeed, inspired by) of the work of Robert Fripp on the Fripp & Eno composition “An Index Of Metals”. Coupled with that ominous trill, is a reverse, distorted guitar that climbs up quickly, in an almost ugly, frightening pattern to a high note, but then is quickly choked off – this riff appears again and again – and then, is suddenly gone. Peace returns. While the ominous, overlaid loop was playing, unbeknownst to the listener, a chorus of acoustic guitars had been gradually added to the piece, now building up, many, many individual notes being picked at a constant pace over the still droning major scale chorus of ebows. As the piece progresses, more voices join the acoustic chorus – until there are many harmonies, all picking at the same continuous rate, together, in stereo, some on the left, some on the right, some in the middle, and then, some Mistove-magic synth-percussive sounds join the ever-increasing twinkling guitars – then our happy, clean reverse lead guitar returns, about five minutes into the piece, but of course we know what that will eventually lead to – the loop plays out, the same reverse clean guitar as in the opening sequence – all of my parts are loops, albeit long loops, except of course for the acoustic, picked notes, which are just long live tracks, many, many tracks, each containing a single, picked note. And that is where the piece goes now, you think it’s going to go back to the “hazard” part, because the reverse clean lead guitar returned, and that’s what heralded the frightening part before, but not this time, we want to accentuate the positive, so we have another lengthy section of again, building harmonies on the acoustic guitars, as well as more beautiful, bright, shiny synth percussion from Ken – which just sparkles over the top of my reverse guitar part so, so beautifully. The twinkling guitars takes a back seat, the reverse guitar suddenly disappears, and at last, our ominous friend, the disturbing, two-note trill plus ascending “Index Of Metals” loop, returns, at about 8:10, to haunt us again with it’s terrifying demeanour. After so many minutes of bright, happy, major key music, this simple, short, almost creepy little loop sounds far more ominous than it might in a darker setting. Our clean reverse guitar loop returns one last time, this time juxtaposed against the looped backing in a slightly different way – now not quite as happy, but still lifting the piece way back up after the dark passage. At 10:05, more sparkling, amazing percussive bell-like sounds, like electronic bell-crickets, appear, and the clean reverse melodic guitars drift across the stereo field gently – and we realise we are safe, the terror won’t be returning again - the piece fades quite suddenly into an amazing shower of magic Mistove “percussion” - and is gone. This piece is as disturbing as “Unglass” is positive. Everything about this piece indicates some kind of mild musical discomfort, and a very strange, chopped, brittle-sounding bass riff gives the piece its name. Sounds don’t so much appear in this piece as shudder into existence, and I love the unique, almost unnatural musical atmosphere that this unusual work generates. Ken has done some amazing panning work here, but it is subtly embedded in the overall stereo field, so it’s not overly obvious – but there is a lot of really beautiful “stereo” going on throughout this piece. A distraught, minor key group of looped and layered sounds grows fairly quickly out of the silence, now fading up quite quickly, and it’s such a bewildering array of amazing and bizarre tonalities, that the ears, and the brain, don’t really know what element or elements to try and focus on. It’s a cohesive, “mixed” whole from the very beginning, yes, you can hear the stuttering, frightening bass part, you can hear that loops of constant sound are occurring, you can hear synthesizers playing long, long chords – but a lot of strange events occur too, a note suddenly pulled down in pitch, or new sounds suddenly emerge, only to almost immediately disappear again…before the brain can even identify “what” the sound is. It’s like a wave, a big, shuddering wave, containing so many disturbing and uncertain elements that you can’t really decipher what is IN the wave – is that a flute-like sound? Is that some kind of warped low pitch piano note? Is it a massively frequency-modulated synthesizer chord? A loop of heavily treated energy bows? “Brittle” is both enigmatic but at the same time terrifying, it’s familiar, but not comfortable – and it fills me with a sort of delighted uneasiness when I listen to it. I love how many of the sounds almost seem to “shudder” rather than “flow”, I love the fact that there are events of a short, medium, long and of a continuous nature, all working together to create a brittle, fragile and somewhat uncomfortable “place” that somehow, you are drawn to, the shuddering, juddering bumps and sharp sound events surround you and are almost impossible to make cohesive sense of – so your brain keeps trying to understand – what is this? Where am I? Which to me, means, we succeeded in our goal of creating a piece that oozes atmosphere, texture and a little bit of terror but is still ultimately compelling to the listener – a unique musical world, that draws you in, and holds you there, safe in it’s terrified arms. I’ve never heard another piece quite like “Brittle”, which again, to me, is a message of success, I feel it’s very unique, and I love the mystery and the sound of it. And now we move into the realms of ambience that are neither light nor easy, that are not for the faint of heart. Dark, dark and darker still, this is a very dense piece, and it’s here that Ken really comes into his own again, providing a mind-boggling array of textural elements. “Dark Matter” doesn’t so much start as burst onto the scene, fully formed, with so much activity that it’s difficult to comprehend quite what is going on at first, but then it begins to settle down, and your brain can begin to assimilate it’s forms. A long, ghostly, deep, thick loop fills the musical canvas, floating from side to side, so intense that you think the speakers will burst, whilst mechanised, sequenced, squeaking animalistic synthesizers fiddle around, meddling, a group of them on each side of the stereo field, supporting the massive dark loop construction with an alien chatter of fear and wonder. The title of the piece is so very appropriate, I could easily imagine in the darkness of space, if stars and comets and black holes and matter and energy each made a sound, that it would be a cacophonous, cavernous sound like what we hear on the track. “Dark Matter” – out in the vastness of space, which is so well-suggested by that roaring, beautiful, “wave” of sound that Ken lays over the stereo field over and over and over again – it’s just remarkable how very atmospheric this piece gets in the very short time that it plays - as the shortest of the five pieces on the record, we don’t get to spend a lot of time here, but that is probably good, because even more so than with “Brittle”, this is not a comfortable place to be. In contrast to “Dark Matter”, this track is actually the second longest track on the disc, and it’s a perfect representation of just why Stafford and Mistove work together so incredibly well. In a “long form” piece like this, themes can really develop, plus Ken Mistove had the opportunity, and took it, to do a very unique and creative job of mixing the track in a most musically compelling way. This is based on a long, live energy bow loop that I did – that’s the basic track. Ken then took that track, and beautifully overdubbed it with the amazing array of sounds, mostly synthesizer sounds, that you hear, which compliment and work with the ebow loop so, so well, it’s almost as if they were played live together. So, for the energy bow guitar loop the first time around, you hear single notes, then, on the second round, you hear a second pair of ebow notes being added in, and so on – but all the while, Ken’s sounds sneak in and out of the sound field, sometimes disappearing completely, other times very present, surrounding and engulfing the ever-intensifying ebow layers. My part is live, so, it starts very sparsely, I leave big spaces initially, and then, each time the loop comes around, I add more, so the piece gradually grows and grows…then, at 3:40, something amazing happens – my loop suddenly disappears, and the MOST AMAZING noise starts up, this is the “Mistove Magic” at work, an absolute musical thunderstorm of the most convoluted, twisted and intense, layered sounds you’ve ever heard. This part of the song is absolutely terrifying…but at about 4:45, energy bows return – now, it’s the fully formed, overdubbed and locked ebow loop, with many, many layers – it returns to comfort you, while the frightening wave of sound SLOWLY disperses – a very, very long cross fade indeed. But for that one minute, between 3:40 and 4:40 – wow, hold onto your hat. Unbelievable power and majesty – strong, forceful, compelling, but, brought back to earth at 4:45 when the “happy” ebow loop suddenly returns. Then, starting around 5:57, high-pitched ebows slowly join the loop, so it’s being added to again, it’s been unlocked and is being slowly expanded, as the frightening, swirling wave of terror is slowly fading down to a more comfortable level. Eventually, that terrifying wave is once again safe, bubbling just under the surface in the background, while the more positive, calmer influence of the ebow loop re-asserts itself – the wave disappears completely for a moment at about 6:35, leaving us with JUST the ebow loop – ah, bliss, peace the terror, for the moment, has been banished. For a moment – absolute calm, like the eye of the storm. More new ebow melodies emerge, Ken almost silent, just a whisper, a tiny threat of that massive sound, hovers in the background, threatening to but not quite emerging. During minute eight, the disturbing synth layers start to grow, the ebows trying to maintain a sense of calm, but that edgy disturbance is right there, waiting. It’s absolutely lovely the way Ken has mixed this, there are huge sections of just ebow loop, or ebow loop with added ebow melodies…and it’s on one of those, that, suddenly, the piece fades and ends on a really, really positive note. For the rest of the piece, it’s still there, at varying levels, sometimes, it disappears into complete silence, but – we keep waiting for it to return. But it’s the anticipation, the sense of tension that is developed by this methodology – I just love how Ken mixed his part in with mine, to create this incredibly tense situation, where the terror is released, it overwhelms you, and then you cringe in fear of it’s return for the next 7 minutes – and it never does return, which leaves you with the positive, beautiful layers of calm, reflective energy bow guitars. The ending is just beautiful, a new and really beautiful ebow melody emerges just as the piece suddenly disappears, and it ends on SUCH a positive note, which is a real contrast to the palpably frightening section beginning at 3:40. You would absolutely have expected a return of that powerful theme, especially in a piece of this length, the beauty of it being - just the threat of it returning is enough! I am absolutely thrilled with this piece, and it’s a unique juxtaposition too of two very unique styles – mine, live, looped, improvised, Ken’s – enveloping, seductive, terrifying – but beautiful. Weaved and mixed together in such a perfect way – the terror and the calm, perfectly balanced, exquisitely balanced against each other. “Slack” is a unique piece in the pureambient canon, I am not aware of any other ambient piece quite like it – unless it’s the aforementioned “An Index Of Metals” by Robert Fripp and Brian Eno. But I think in many ways, just due to the way it was constructed, and then mixed, that this is a truly unique musical experience and could only have been created by Saffron Matted Voids. My hat is off to Ken Mistove in particular - first, for his excellent production of the track and second, for his very innovative and unusual mix of the piece – it’s daring, outrageous, and it leaves certain musical elements exposed, in the stark light of day – sometimes Ken’s synth elements, sometimes my ebow loops or loops/melodies, and the consciousness shifts back and forth between the two themes throughout the piece as you listen, driven by the way he has mixed the track. I love how it literally takes you from calm to terror to uneasy calm to sudden beauty, across over ten minutes of texture and innovation. An unqualified success. Based on a darker loop, a descending loop, “Cloud 8” grows much more quickly than “Slack” does, but with stranger harmonies – this is still a classic “Dave Stafford descending energy bow loop” – but, with a twist – some of the notes that I add in as the piece progresses are most unusual choices, and there are some lovely, very carefully added high-pitch and SUPER high-pitch notes in the mix too. The first minute or two of the piece are really all about establishing that loop, about watching it grow more dense, more layered, and becoming comfortable with it’s form. Ken lays back and lets me take the lead, with just the odd, shimmering sound here and there at first, letting the loop “do the talking” to begin with. But then, you start to, almost unconsciously, hear some low, almost inaudible tones, a distant, indiscernible rumbling – so quiet as to almost be non-existent. A mysterious, fragile synth seems to appear – and is gone before you can even mentally register it. A sense of stereo starts to emerge too, you hear both the loop and the almost invisible other sounds in different places in the mix…but basically, it’s still just the loop – until, at 4:45, a new, longer energy bow riff emerges, played “over” the shorter layers – and again, joined by supporting synths which are almost inaudible, so they are felt more than heard. I’ve never heard something so fragile, a thin, shimmering, near-invisible presence – listen at 5:33, where Ken inserts such a synth sound, but it’s so well embedded into the loop that you almost don’t hear it! It’s subtlety on an unimaginable scale – as if he didn’t really want to overdub the loop, so instead, carefully inserted sounds that compliment but don’t overrun, that support but don’t distract, that add but don’t overwhelm – and the effect is, what is really just an ordinary loop, is gradually, more and more as the piece goes on, is cloaked in magic, which makes it breathe and live in a way it never would have as a solo piece. Ken’s tiny, nearly invisible embellishments give the track an ethereal quality that it did not have before he worked on it, in fact, I was unsure if the loop I had supplied for him to work on was “good enough”, and we worked on this track for a long, long time. In minute eight, you start to hear Ken a little bit more, but by now, the loop’s repetition has begun to stick in your brain, so part of your consciousness “locks in” on JUST the loop, but at the same time, you “hear” these other tiny, fragile, musical events that Ken has subtly added – it’s as if he stuck little bits of musical enhancement tape to the structure of the loop. Your ears hear a tiny tinkling sound here, an inaudible bass rumble there, a mysterious, fragile, fleeting noise on one side, a fragment of a glimpse of a piece of a chord on the other – and it’s all part of the loop, every single sound in the piece, whether it’s part of my ebow loop or not – is part of the loop. Because Ken just “knew”, he somehow knew exactly what to do to enhance this loop, to take it from the ordinary to the extraordinary. I for one don’t quite understand how it did it, but that’s exactly why, if I have the chance that Ken would be available to do so, that I would always get Ken to both produce and mix any tracks I am working on, solo or group. This piece is a fantastic example of why he is so brilliant at both, the subtly of his musical contributions is mind boggling, you almost don’t hear any of them – but if you listen, they are ALL OVER the piece – just so well mixed, so transformed into the actual loop, that the two separate parts become one piece of music with a unique identity – and you suddenly find yourself on “Cloud 8”. The name came much, much later – the piece was done or nearly done, as was the album, and we had no name for it, I had a dream one night about the “other clouds” the ones “below” cloud nine, so I came up with this idea that it’s slightly less than cloud nine, which of course would be cloud 8. That became the title, and with the completion of that, the album was, at long last, done. 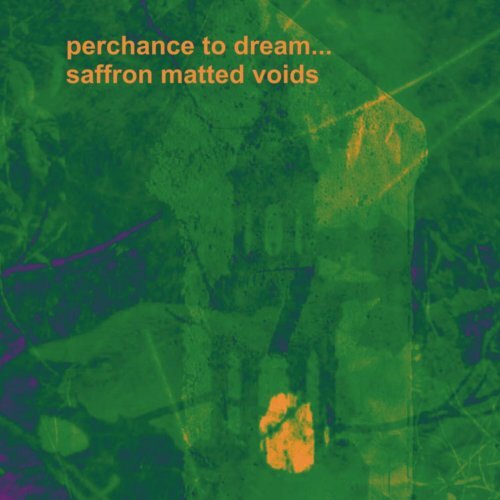 It took three years to make this album, which for me, is a very long time, but, as an entity, Saffron Matted Voids has a very specific and unusual niche, and both Ken and myself wanted our first record to be a reflection of both where we had been and where we were going with ambient and technology-driven music. It’s unfortunate that during that three year period, I was very, very ill for one of those years, so we really couldn’t continue work until I recovered, and just as that illness delayed and harmed the production of my album “all things being equal”, it also had an effect on this record – but in the end, both albums did get made. The follow up to “Perchance To Dream” didn’t happen in the intervening 7 years since 2003. Both Ken and I had a lot of other music, business and life issues to take care of, Ken got married and moved from New Jersey to California – ironically, not that long after I moved FROM California to Scotland. Now, in 2010, we’ve decided to partner on a more serious basis, and are currently working on developing both the new, revitalised pureambient web site but also collaborating on the creation of the first ever pureambient store. As part of all of that effort, we are also discussing the possibility of a second Saffron Matted Voids album, made under conditions now where I am not ill and my condition would not have any potential negative impact on the project. We are both still far too busy to undertake the commitment to making that second album, but perhaps next year we will be able to clear our schedules, and see what Saffron Matted Voids sounds like in the year 2011. I look forward to it, I think that “Perchance To Dream” is an excellent debut album, it sets out a unique musical territory for the band to inhabit, and I also believe that after some much needed work on our lives, that both of us are now ready to approach SMV with renewed vigour and commitment.